A click onto the map transmits you to the interactive Google Maps page. On Motorway A1 (E37) take exit 95a (Remscheid/Lennep), subsequently turn off onto the L58 in direction Remscheid/Lennep. After crossing the railways turn right into Lüttringhauser Straße. Follow straight on up to junction Mollplatz/Thüringsberg (Lennep Old-town Ring), there turn left and again right (Mollplatz). After 75 m turn left into the Gänsemarkt, the next turnoff to the right after approx. 100 m is Martinsgasse. With the railway to Wuppertal Hauptbahnhof (Central Station). From there on working days local trains travel to the station Remscheid-Lennep every 20 minutes. From there it is an approximately 600 m walk to my workshop. To get there: please stay on the left on the street Am Bahnhof, from there turn to the right to Bergstraße. At the end of it turn to the left into Poststraße, at its end turn to the right into the street Mollplatz. Follow this street to the end and stay on the right. After 50 m turn to the left into the Gänsemarkt. The next turnoff to the right, approx. after 100 m, is the Martinsgasse. The Bergisch Country spans a south-eastern part of the German federal state of North-Rhine-Westfalia. Its varied submountainous landscape is characterized by woods, grassland, hills and narrow brook valleys. 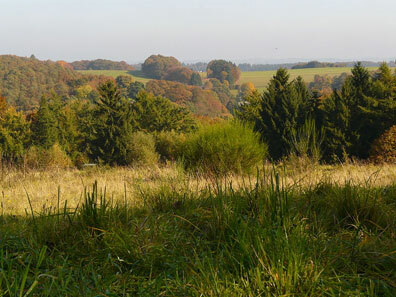 The natural park Bergisch Country is a popular recreation area in this region. Lennep is the second largest district of Remscheid. As Prussian county seat and member of the Hanseatic League it once was one of the most important cities of the Bergisch Country. 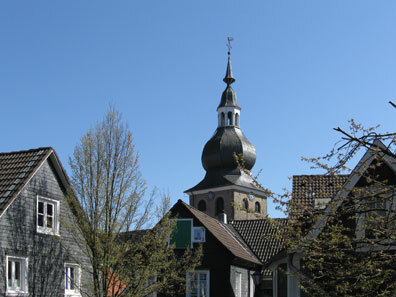 Up to this very day, the historic city centre of Lennep reveals its medieval structures. More than 100 buildings of the city core are listed monuments, especially those of the “Bergisch Baroque” which were built after a devastating fire blast in 1746, e. g. the Old Town Hall, the main building of the present Röntgen Museum and the protestant municipal church with its baroque roof hood shaping the cityscape. Luckily, the historic city centre of Lennep remained almost unscathed by the Allied bombing during the Second World War. Since the 1970s, the residual stock of 18th century buildings was extensively reconstructed, maintaining the unique urban ensemble up to this very day. Moreover, both Lennep and the Bergisch Country are a centre of harpsichord making. The local master workshops emerged from numerous apprentices of the piano company Sassmann, founded in Remscheid-Lennep in 1955. In the year 2000, at the initiative of Bergisch harpsichord makers, musicians of the protestant Lennep Church congregation, and other harpsichord aficionados, the Lennep Cembalo Days were brought into being – the only German harpsichord festival nationwide. Since then, every two years lovers of Old Music and harpsichords are coming to Lennep to enjoy concerts with renowned international artists. All instruments provided for this event are built by local harpsichord makers according to historic originals.